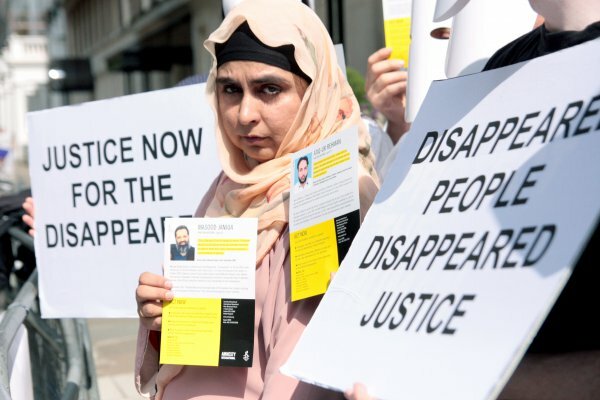 Peace and human rights activist Ibn Abdur Rehman has spoken about the practice of enforced disappearances in Pakistan, which for many years already have caused agony for many ethnic groups in Pakistan. By delivering a speech on the International Day for Victims of Enforced Disappearances on 30 August 2016, Mr Rehman shed light on the significance of this problem, even in terms of numbers and on how the Pakistani government should be forced to address it seriously. Next Tuesday [30 August 2016], which falls on the International Day for Victims of Enforced Disappearances, the world will take stock of the progress or otherwise of efforts to end the outrage that enforced disappearances are. It will be an appropriate occasion for the government of Pakistan to take a fresh look at the problem that has caused endless agony to thousands of families over the last many years. Since March 2011, the government has left the second Commission of Inquiry on Enforced Disappearances (CoIoED) to grapple with this huge issue. One good thing the commission does is that it files monthly performance reports with the federal and provincial authorities. Unless these reports remain unread, the government cannot pretend to be ignorant of the fact that enforced disappearances is still a major human rights issue in the country and that a thorough reappraisal of the efforts to solve it is overdue. The commission receives fresh reports of disappearance in considerable numbers month after month: 56 cases in January this year, 66 in February, 44 in March, 99 in April, 91 in May, 60 in June and 94 in July. That is, 510 cases in the last seven months, or an average of 72.86 cases per month. Although many more instances of enforced disappearance are not reported, the number of cases received by the CoIoED is high enough for the government to abandon its complacency. At its inception in March 2011, the commission had only 138 cases on its roster that had been left pending by the 2010 inquiry commission comprising three former judges of the superior courts. The number of cases received by it till July 31, 2016 has risen to 3,522. Out of these cases, 2,105 have been disposed of — a creditable achievement no doubt. But the average disposal rate over the 64 months of the commission’s existence is no higher than 32.89 cases per month. This year’s disposal rate is much higher — 483 cases over seven months, or an average of 69 cases per month. The cases pending on Aug 1 last numbered 1,417. If fresh cases continue being reported at this year’s rate (72.86 cases per month), even at the improved disposal rate the commission will not be able to complete its assignment for many years. The cases disposed of since March 2011 includes 491 that, for one reason or another, could not be accepted as enforced disappearances. Obviously, a much larger number of cases were inquired into as incidents of involuntary disappearance. What are the commission’s findings? Out of the 483 cases decided during the last seven months, 111 were dropped for not being enforced disappearances and 372 persons were traced; 189 persons, happily a little more than 50pc of the total, were said to have returned home. The commission does not tell us where these people were during the period they could not be traced by their families. The Supreme Court once issued instructions for such people to be interviewed so that those responsible for their disappearance could be identified and punished. That still needs to be done. With regard to the 183 persons who have been traced this year and have not returned home, they fall into the following categories: under trial — 48; held at internment centres — 46; lodged in prisons — 46; held by Rangers for 90 days — 21; reported dead — 20; killed in encounter — 2. How and when were the 92, who are facing trial or are held in prisons, received by the police? This issue was examined by the commission of 2010 and it passed strong strictures on the police practice of registering crudely concocted cases against persons it received from the intelligence agencies; and, the quashment of a couple of such cases was ordered. The cases of the unfortunate 92 must be thoroughly probed. One of the 20 persons reported dead is said to have died in a jail; his death as well as the killing of two persons in ‘encounters’ must also be judicially scrutinised. No review of disappearances can be complete without taking notice of the plight of Hamid Ansari and Zeenat Shahzadi. The former, a young Indian engineer, illegally entered Pakistan because he wanted to help an internet friend, a young girl, and was arrested in 2012. The authorities denied any knowledge of him for a long time and eventually disclosed that he was tried by a military court and sentenced to three years’ imprisonment. The Peshawar High Court is hearing his petition for the inclusion of the pre-trial period of detention in his imprisonment term, but now concern has been raised about threats to his life in prison. The government must ensure his safety and it will be proper to start preparing for his repatriation to India. The case of Zeenat Shahzadi, who was pursuing Ansari’s case, is no less serious than Qandeel Baloch’s, the model who was killed because she wanted to live by her own lights. Zeenat too had dreams that many would consider normal — a poor woman’s ambition to be a journalist and to make a name as a fighter for lost causes. She disappeared over a year ago and her case is pending before the commission of inquiry. At each hearing the law-enforcement agencies spin out meaningless tales. The commission cannot force anyone to fulfil the state’s obligation to find the involuntarily disappeared persons, regardless of who is responsible for it. It is surely time the government reviewed its decision to leave the issue of disappearances to a commission of inquiry with meagre resources and little authority to enforce its will on hardened experts in cover-ups and denials. Either this commission should be turned into a judicial tribunal, with adequate powers and resources, or a new commission should be set up. Otherwise the state will continue to get a bad name for not dealing with disappearances with the seriousness the matter has deserved all along.